I guess I was just kidding when I said I was moving on from headwear - I took a quick look back at that page to see if I missed anything, and what do you know, I did! I’m not surprised that I didn’t think of it at first, though, because it’s not a very traditional bachelorette party option. Tiaras and veils are both classic attire, but this is something new that I guess has been on an upward trend recently. 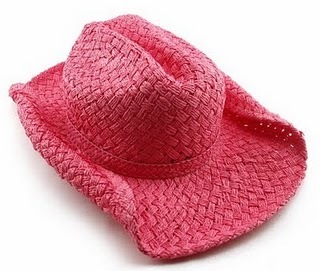 And that trend is cowgirl hats. 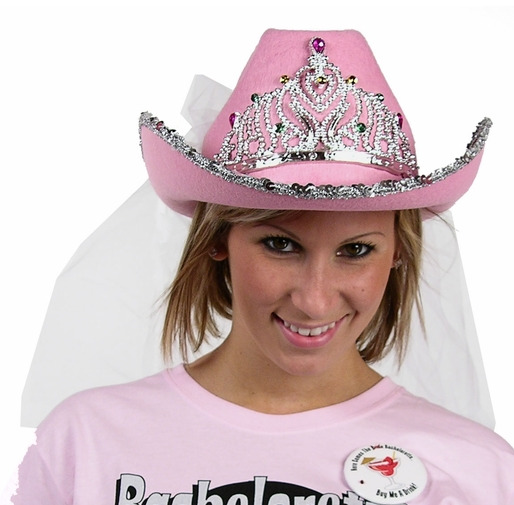 I guess it’s a sign of the changing times, or something, and cowgirl hats give off a more wild party vibe than tiaras or veils. I guess that makes sense. It’s just a little strange; everybody wore tiaras and veils back when I was planning parties regularly. But I don’t want to give outdated advice, so here are some of these new hats for the modern-minded girls out there. This one’s pink with a bunch of gems and rhinestones on the front of it, it looks like. So if your bachelorette likes flashy, it’s certainly that. And it manages to pull it off without being gaudy - I think it looks pretty cute. I’d never wear it, of course - I was a traditional tiara+veil gal - but if you’re looking for a cowgirl hat, this is probably my favorite one. And with that, I think I’m finally done covering headwear, for real this time. 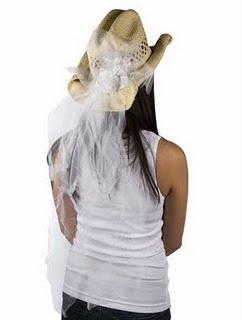 I promise, I’ll move on to some other clothing accessory next time! I promise!